Taylor played 12 snaps in his team’s opening game against the Baltimore Ravens, and he performed well. He logged 9 snaps against the run, and produced one stop (a solo tackle that constitutes an offensive failure). He ended the game with a PFF run-defense grade of 81.9, the fourth-highest run-defense grade on his team. 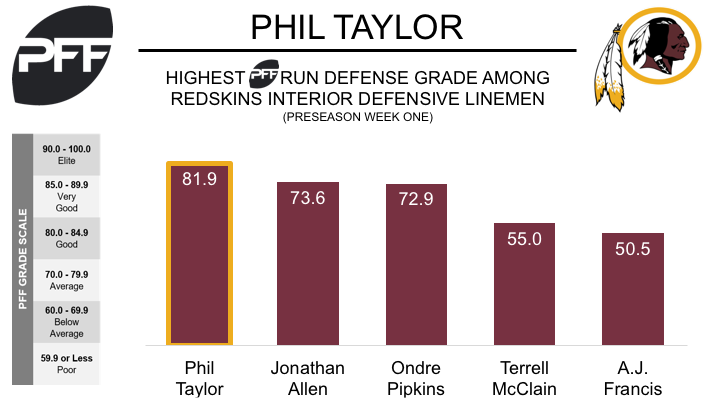 Taylor has struggled with injury over the last three seasons, and hasn’t played in the NFL regular season since 2014, but if he can stay healthy, Taylor has proved he can perform at the highest level. The highlight of his career came in 2012, where his run-stop percentage of 10.7 percent ranked fourth among all defensive tackles in the NFL.